Fiery Heights has staked a claim for the Brisbane summer carnival with his win at Doomben. 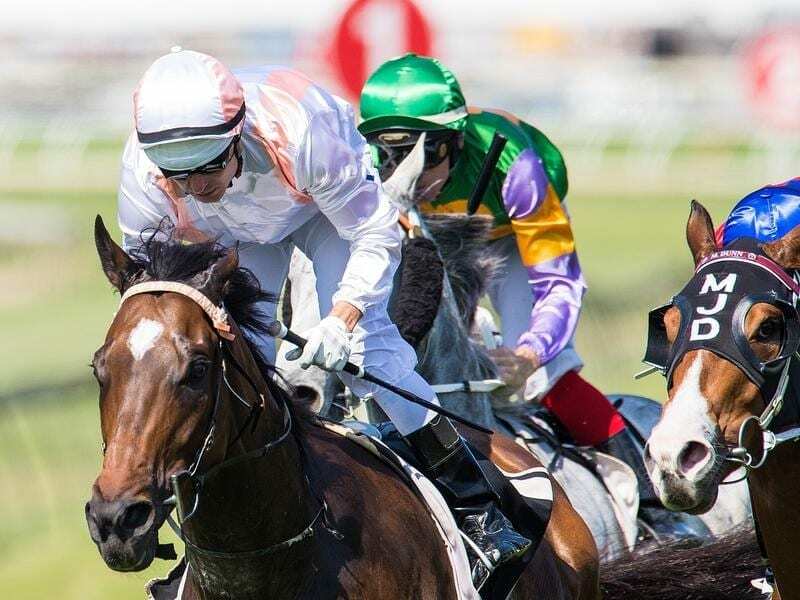 Trainer Barry Lockwood was looking to the Brisbane summer carnival while rival Matt Dunn has even bigger things in mind after a thrilling finish at Doomben. Lockwood’s galloper Fiery Heights ($4.80) led all the way to beat Taillevent ($21) by a half head with another half head to Dunn’s galloper and favourite Snitz ($2.15) in third place in the Simon George Sells Strawberries Handicap (1200m). Fiery Heights has been in great form since joining Lockwood’s Eagle Farm stables where he has now recorded two wins and two seconds. “He did it very well at both ends today. They were there to run him down but he fought on too well for them,” Lockwood said. Fiery Heights previously had a reputation for not always performing to his best. “I showed him my bank balance and that might have done the job,” Lockwood said. Dunn is headed to the $1.3 million The Kosciuszko at Randwick on Saturday week with Snitz. “He had his chance but he was first-up and he kept coming. They have run slick time and that should top him off nicely,” Dunn said. Michael Cahill, who replaced ill rider Ryan Maloney on Snitz, said the gelding would be improved by the effort. Trainer Robert Heathcote got a treble and denied Lockwood a double when Bold Chance ($3.90) beat I’ve Gotta Nell ($3.40) by a nose in the Canadian Club Handicap (1050m). Heathcote had earlier won with Alpine Dancer ($5.50) and Stella Victoria ($1.28).